Santa's clothing must feel terribly uncomfortable while delivering presents in the Southern Hemisphere, amirite? - Amirite? - Post your opinion and see who agrees. 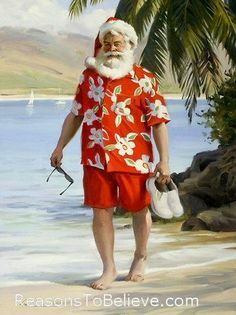 +45Santa's clothing must feel terribly uncomfortable while delivering presents in the Southern Hemisphere, amirite? He has a different outfit for the hotter climates and must make do! Someone behaved really badly, apparently. That, or he had to stop for an emergency. @primeiro Someone behaved really badly, apparently. That, or he had to stop for an emergency. Can you imagine a jolly old elf whose belly jiggles like a bowl full of jelly wearing that? I will be carrying that image in my head for the rest of the day. Thank you for that! @Chris_the_Demon I will be carrying that image in my head for the rest of the day. Thank you for that! Oh, sorry... here, this may help. Santa has much bigger issues to contend with. A scientist once calculated that for Santa to deliver one present to every good child in the world, his sleigh would have to travel at 650 miles per second. That means Santa would be exposed to centrifugal forces 17,000 times greater than Earth's gravity. In less than one second he would be crushed by 4 million pounds of pressure before he, the sleigh and all the reindeer exploded into a fire ball. You mean 650 miles/second, not miles per hour. @Thinkerbell You mean 650 miles/second, not miles per hour. Oops! Thanks for the correction. @Chris_the_Demon Oops! Thanks for the correction. Nah - he wears shorts, t-shirt and flip flops.